Wow, what a story… something of a fairytale indeed… I can’t believe the young soul was only 9 at the time and handled himself so beautifully… I have no trouble imagining that those flatbreads were the best things he had ever tasted! Amazing how these unplanned moments in our lives – in this case, an act of kindness – get seared into our hearts forever. 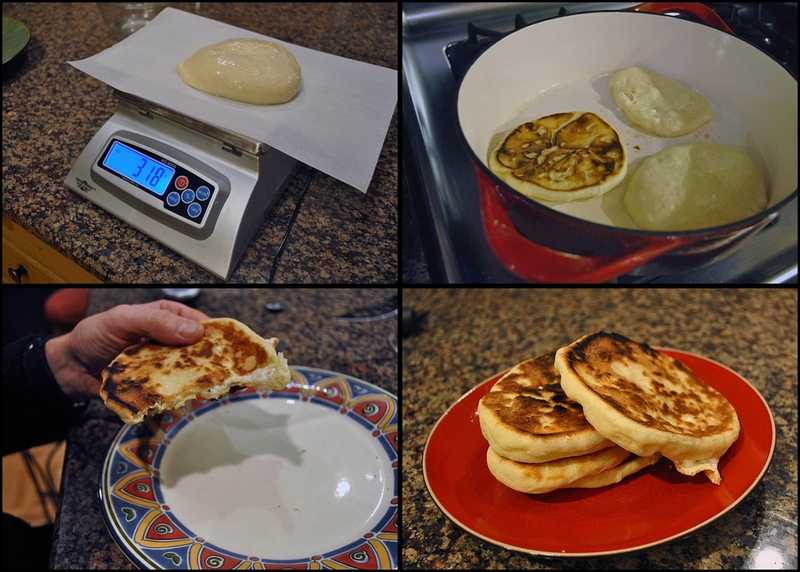 These flatbreads look fantastic Sally – I love the rustic charred appearance and the fact that they contain cheese… wow. Just visited Codruta’s blog – gorgeous indeed! Lovely post and that bread looks fantastic! Wonderful photos. Thanks, Maureen! I wish I had stretched them thinner, but it’s hard to get it right the first time. Still, it tasted TOO good! This will be another one of the many things you have inspired me to make. Were you happy with your choice of cheese? Well, I wrote down the name of the Romenian cheese, and next time I go to Whole Foods I’ll inquire what they recommend as a substitute. But the Mexican cotija was not bad at all…. I just googled Unilact. I ignored the results pertaining to a pharmaceutical made by Upjohn and found 2 pages that might be helpful. It seems to be a brand name and in more than one country. Update, here’s more specific info: Unilact makes a branza de burduf and I thinks that is what was used. Cindy, “branza de burduf” is the cheese I used. I don’t know if the one selled by parthenonfoods is good or not, but you should know is a smelly cheese, strong flavor, it goes wonderful with polenta, scrambled eggs, or just plain, with a good bread and home grown tomatoes. Sally is this sourdough discard that you used? Funny because I recently got a book from the library and there is a recipe called Khachapuri which is basically a yeasted version of this dough. The dough was a pleasure to work with. I am teaching a flatbread class at a wood fired oven at a nearby folk school and I did a practice run of this recipe in their oven…WONDERFUL! I cannot get Google translate to translate Codruta’s blog…what am I doing wrong? 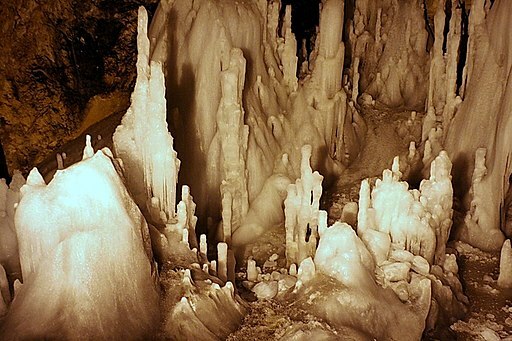 Not sure what’s more breathtaking, the caves or the bread. OK, the bread. What? I love carbs. I liked Codruta’s cheesebread which remind me of my own childhood experiences though there are no caves in my story only memories of a little girl waiting til her mother finish making cheese strudel and then rolling out a few of these breads with the trimmings from the strudel to fry just for her to enjoy with some jam spread on the outside. The contrast between the sweet cold fruit jam and the hot salty, oily cheese bread was amazing. Having tried several, I have settled on the recipe in Peterson’s “Baking” for the dough. My favorite filling is cabbage. I bought poppy seeds to try next time. Donna, the original recipe (the one that my boyfriend ate years ago, and the one I took my inspiration from) is a yeasted version (with milk and an incredible amount !!! of oil in it). I’m sure this type of dough can be found in many regions of the world, it’s a simple enriched dough, after all. My main contribution however, was to adapt it to a sourdough version (and to replace milk with yogurt (for more flavor), to reduce the amount of fat, etc. )… to make it healthier without compromising the taste. I feed my starter dailly and I usualy make the dough with the discard. Sally, thank you again for your flattering words and thank you for trying my recipe and writing about it. I’m curious to know if you and phil will enjoy the cabbage filling version. So glad that you both enjoyed the post! Now, I have another recipe, more traditional, that calls for shaping them as small balls and baking free on a piece of parchment paper. I will fish it out and send you by email, just in case, ok? It calls for ingredients that might be harder to find for you, though. If I remember corectly, two types of tapioca flour, one called “sour” and one called “sweet” – they are found in Brazil, but I’ve never seen them in the US or France. I can use some small tins that I use for fruits tarts, but I guess that at some point I’ll get tired of improvising and I’ll buy some real muffin tins. The traditional recipe that you mentioned about sounds interesting, I’ve seen tapioca flour here, but I don’t know if is sour or sweet. Codruta ,muffin tins (with 6 or 12 holes) you can find in Timisoara at kitchenshop located in Iulius Mall. Love the story! Those look and sound amazing. I am not a baker, but I just might be tempted to try these…..
I’m happy that you post Codruta story .The name of the country is ROMANIA ,please corect ! and, as I mentioned in the post after correcting it, the name in Portuguese is ROMENIA, that’s the reason I got it wrong. To give you another example, Brazil in Portuguese is spelled Brasil, so I cut some slack for Brazilians who might make a “typo” in English. Adriana, let’s not nitpick over tiny details, shall we? The mistake was unintentional and Sally already explained the source of confusion. What a beautiful story! I really enjoyed reading it. 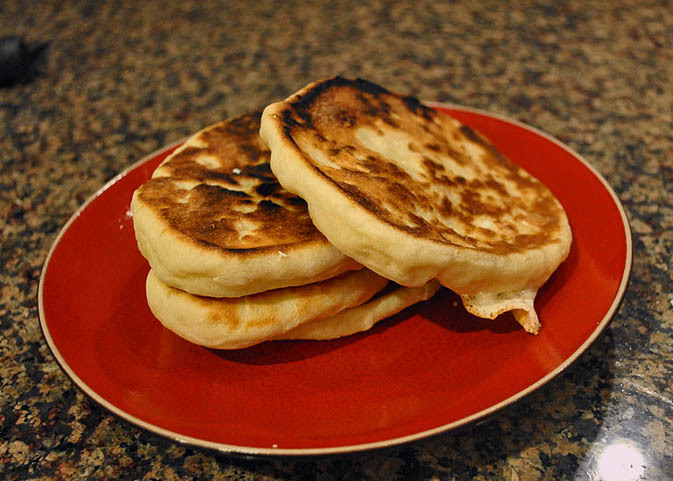 Those flatbreads are unknown to me and look amazing! A wonderful treat. I’m going to do some Indian cooking soon and I’ll be including an easy spinach paratha that you might be interested in trying. Will let you know when I post it if you’d like. I love the fact that once you make them, they are ready in minutes, and you eat them right away, hot from the stove. Bread baking is wonderful, but that deal of waiting for the bread to completely cool before slicing… not easy, my dear… not easy! Oh, I would love to see you blog about those! With your cooking skills and stunning photography, they will be like masterpieces! 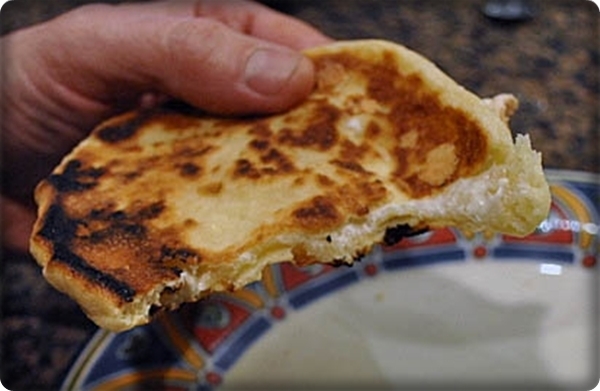 flatbread filled with cheese-could life get any better? this is amazing- Love the thinness of your flatbread- great job! What a beautiful, beautiful recipe! And I love the story that goes with it… Another must-make on my list! MC, you should make it with some of your fantastic sourdough starter… but make sure to check COdruta’s site, because she put my rolling of the dough into severe shame! They look gorgeous Sally! and Codruta’s blog is so amazing – I am in awe of the beautiful breads she produces. You are both perfectionists! Great post ! A lovely story Sally. I wish I had the energy to make these. They sound tasty.